Five-spice powder (五香粉) is a very commonly used ingredient in Chinese and Taiwanese cuisine and encompasses all five flavors: sweet, sour, bitter, salty, and umami. Based on the name, you can probably guess there are five different spices in this Asian seasoning. These are commonly a mixture of star anise, cloves, Chinese cinnamon, Sichuan pepper, and fennel seeds, but five-spice powder can also include anise seeds, ginger root, nutmeg, turmeric, amomum villosum pods, cardamom pods, licorice, orange peel, or galangal. In a dry skillet or wok, toast the Sichuan peppercorns by shaking the pan over low to medium heat until the aroma of the peppercorns is released. This will take around 3 minutes. Grind the roasted peppercorns and star anise in a blender, pepper mill, or spice grinder. Pass the blended seasonings through a strainer so you are left with an even consistency. Place the mixture back into the blender and grind the seasonings until very fine. Store in an airtight container and keep it in a dark and cool space. 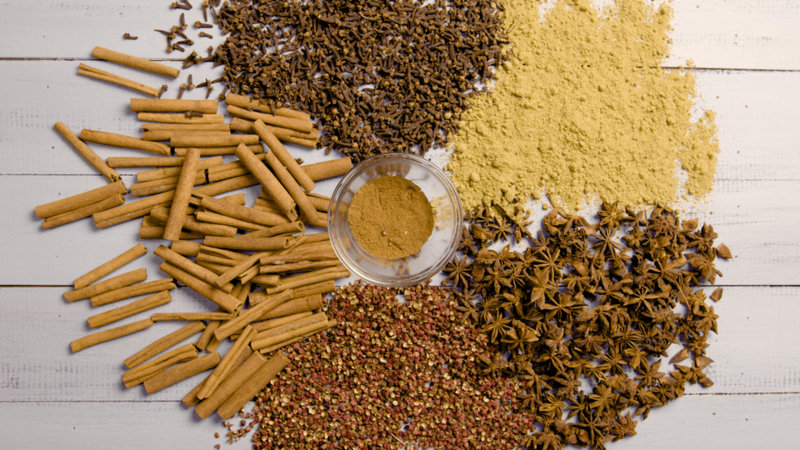 In southern China, five-spice powder usually includes Saigon cinnamon and orange peel instead of the traditional Chinese cinnamon and cloves. If you happen to come across this version, it will taste different compared to your recipe and those from other regions of Asia. Use five-spice powder sparingly as a spice or a meat rub, as it can be quite strong. Substitute black peppercorns if you don't have Sichuan peppercorns on hand. Ground anise can also stand in for star anise (a 1/2 teaspoon of ground anise is equal to one star). Several Chinese recipes feature five-spice powder on the ingredient list, like five-spice pork with bok choy and green onions and princess chicken. But not every recipe has to be Asian in nature. See how a typical roasted chicken or glazed carrots recipe takes on a whole new life when seasoned with this flavorful mixture.